Concerned by the increasing insecurity in the country, the Senate yesterday, reiterated its call for the establishment of state police if the problem must be nipped in the bud, just as it condemned in very strong terms, the killings nationwide. The Federal Government on Sunday ordered foreign miners to vacate mining sites in Zamfara States and its environs with immediate effect. Briefing State House correspondents at the presidential villa Abuja, the Acting Inspector General of Police, Mohammed Adamu, said that any foreign miner that continues mining activities would have his license revoked. The INEC National Commissioner and Chairman, Information and Voter Education, Festus Okoye, in an interview with our correspondent, noted that all the uncollected PVCs were still locked up at the Central Bank of Nigeria as promised by the Commission until after the elections. 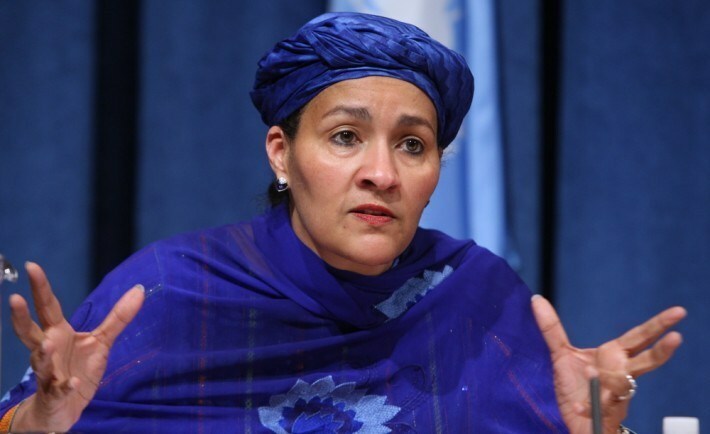 The deputy secretary-general of the United Nations, Amina Mohammed, has predicted that a woman would succeed President Muhammadu Buhari in 2023. Mohammed, who was Nigeria’s environment minister before she resigned to take up the UN job, said this at the Mo Ibrahim governance weekend in Abidjan today. She expressed readiness to become the campaign manager for the woman when the time comes. An Igboseree High Court, Lagos Wednesday gave suspected billionaire kidnap kingpin, Chukwudumeme Onwuamadike alias Evans, till May 17 to get a counsel to defend the criminal charges against him. Justice Adedayo Akintoye told Evans, whose case has suffered three adjournments following his failure to secure legal representation, that he had only three options. He could defend himself, get a new counsel or the court would appoint a legal aid counsel for him, Justice Adedayo said. The Independent National Electoral Commission (INEC) has fixed 2nd November, 2019 for governorship elections in Kogi and Bayelsa states. The decision, the National Commissioner in-charge of Information and Voter Education, Festus Okoye in a statement was reached at the end of INEC’s meeting Tuesday. Two persons were dead on Wednesday when a fight broke out at Fadeyi, Ikorodu road area of Lagos among hoodlums, or better known as area boys. According to The Nation, the two persons were a dispatch rider killed by a stray bullet when he rammed into the scene and an unidentified man from the hoodlums. Following the incessant high cases of electoral offences in Nigeria, the Independent National Electoral Commission (INEC) has proposed a fine of five hundred thousand naira or three years imprisonment or both for persons convicted of vote buying and selling. Chairman of the Commission, Professor Mahmood Yakubu disclosed made the disclosure at the 9th Forum of the Anti-Corruption Situation Room, organised by the Human and Environmental Development Agenda (HEDA) held in Abuja on Wednesday. Justice Taiwo Taiwo of the Federal High Court, Abuja, on Wednesday withdrew from the suit filed by Governor Rochas Okorocha of Imo State in respect of his Certificate of Return. He further announced that the case file would be returned to the Chief Judge of the Federal High Court, Justice Adamu Abdu- Kafarati, for reassignment to another judge.